Threats against freedom of expression come in all shapes and sizes. We need to stand up to the bullies together. There was another group who recognised that there are many places in the world where speech is curbed (North Korea was mentioned a lot), but most refused to accept that any threat existed in modern, liberal democracies. After the killing of 12 people at the offices of French satirical magazine Charlie Hebdo, that argument died away. The threats that Index sees every day – in Bangladesh, in Iran, in Mexico, the threats to poets, playwrights, singers, journalists and artists – had come to Paris. And so, by extension, to all of us. Those to whom I had struggled to explain the creeping forms of censorship that are increasingly restraining our freedom to express ourselves – a freedom which for me forms the bedrock of all other liberties and which is essential for a tolerant, progressive society – found their voice. Suddenly, everyone was “Charlie”, declaring their support for a value whose worth they had, in the preceding months, seemingly barely understood, and certainly saw no reason to defend. The heartfelt response to the brutal murders at Charlie Hebdo was strong and felt like it came from a united voice. If one good thing could come out of such killings, I thought, it would be that people would start to take more seriously what it means to believe that everyone should have the right to speak freely. Perhaps more attention would fall on those whose speech is being curbed on a daily basis elsewhere in the world: the murders of atheist bloggers in Bangladesh, the detention of journalists in Azerbaijan, the crackdown on media in Turkey. Perhaps this new-found interest in free expression – and its value – would also help to reignite debate in the UK, France and other democracies about the growing curbs on free speech: the banning of speakers on university campuses, the laws being drafted that are meant to stop terrorism but which can catch anyone with whom the government disagrees, the individuals jailed for making jokes. And, in a way, this did happen. At least, free expression was “in vogue” for much of 2015. University debating societies wanted to discuss its limits, plays were written about censorship and the arts, funds raised to keep Charlie Hebdo going in defiance against those who would use the “assassin’s veto” to stop them. It was also a tense year. Events discussing hate speech or cartooning for which six months previously we might have struggled to get an audience were now being held to full houses. But they were also marked by the presence of police, security guards and patrol cars. I attended one seminar at which a participant was accompanied at all times by two bodyguards. Newspapers and magazines across London conducted security reviews. But after the dust settled, after the initial rush of apparent solidarity, it became clear that very few people were actually for free speech in the way we understand it at Index. The “buts” crept quickly in – no one would condone violence to deal with troublesome speech, but many were ready to defend a raft of curbs on speech deemed to be offensive, or found they could only defend certain kinds of speech. The PEN American Center, which defends the freedom to write and read, discovered this in May when it awarded Charlie Hebdo a courage award and a number of novelists withdrew from the gala ceremony. Many said they felt uncomfortable giving an award to a publication that drew crude caricatures and mocked religion. 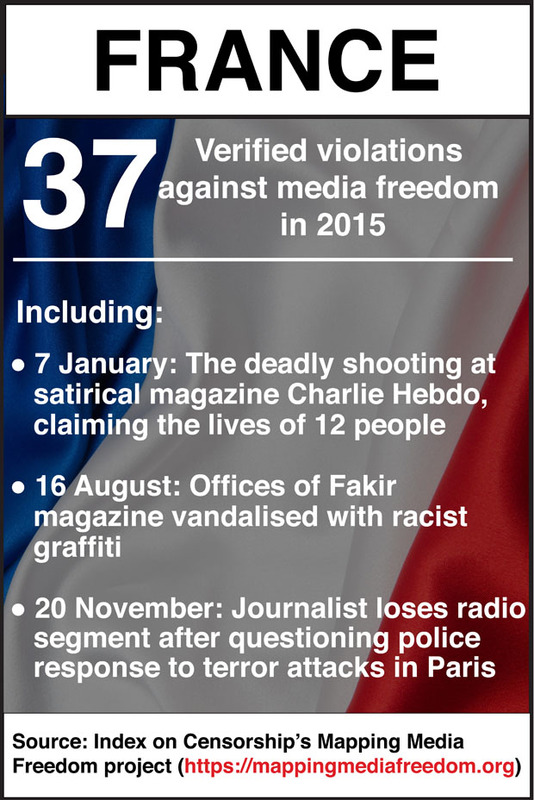 Index’s project Mapping Media Freedom recorded 745 violations against media freedom across Europe in 2015. The problem with the reaction of the PEN novelists is that it sends the same message as that used by the violent fundamentalists: that only some kinds of speech are worth defending. But if free speech is to mean anything at all, then we must extend the same privileges to speech we dislike as to that of which we approve. We cannot qualify this freedom with caveats about the quality of the art, or the acceptability of the views. Because once you start down that route, all speech is fair game for censorship – including your own. Index believes that speech and expression should be curbed only when it incites violence. Defending this position is not easy. It means you find yourself having to defend the speech rights of religious bigots, racists, misogynists and a whole panoply of people with unpalatable views. But if we don’t do that, why should the rights of those who speak out against such people be defended? In 2016, if we are to defend free expression we need to do a few things. Firstly, we need to stop banning stuff. Sometimes when I look around at the barrage of calls for various people to be silenced (Donald Trump, Germaine Greer, Maryam Namazie) I feel like I’m in that scene from the film Lock, Stock and Two Smoking Barrels where a bunch of gangsters keep firing at each other by accident and one finally shouts: “Could everyone stop getting shot?” Instead of demanding that people be prevented from speaking on campus, debate them, argue back, expose the holes in their rhetoric and the flaws in their logic. Secondly, we need to give people the tools for that fight. If you believe as I do that the free flow of ideas and opinions – as opposed to banning things – is ultimately what builds a more tolerant society, then everyone needs to be able to express themselves. One of the arguments used often in the wake of Charlie Hebdo to potentially excuse, or at least explain, what the gunmen did is that the Muslim community in France lacks a voice in mainstream media. Into this vacuum, poisonous and misrepresentative ideas that perpetuate stereotypes and exacerbate hatreds can flourish. The person with the microphone, the pen or the printing press has power over those without. It is important not to dismiss these arguments but it is vital that the response is not to censor the speaker, the writer or the publisher. Ideas are not challenged by hiding them away and minds not changed by silence. Efforts that encourage diversity in media coverage, representation and decision-making are a good place to start. Finally, as the reaction to the killings in Paris in November showed, solidarity makes a difference: we need to stand up to the bullies together. When Index called for republication of Charlie Hebdo’s cartoons shortly after the attacks, we wanted to show that publishers and free expression groups were united not by a political philosophy, but by an unwillingness to be cowed by bullies. Fear isolates the brave – and it makes the courageous targets for attack. 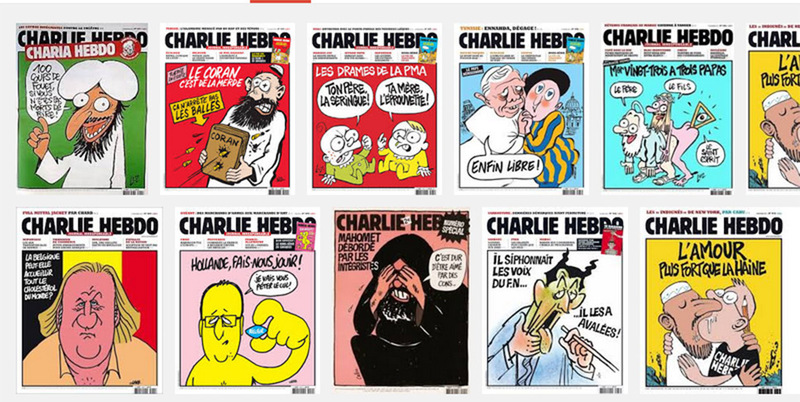 We saw this clearly in the days after Charlie Hebdo when British newspapers and broadcasters shied away from publishing any of the cartoons featuring the Prophet Mohammed. We need to act together in speaking out against those who would use violence to silence us. As we see this week, threats against freedom of expression in Europe come in all shapes and sizes. The Polish government’s plans to appoint the heads of public broadcasters has drawn complaints to the Council of Europe from journalism bodies, including Index, who argue that the changes would be “wholly unacceptable in a genuine democracy”. In the UK, plans are afoot to curb speech in the name of protecting us from terror but which are likely to have far-reaching repercussions for all. Index, along with colleagues at English PEN, the National Secular Society and the Christian Institute will be working to ensure that doesn’t happen. This year, as every year, defending free speech will begin at home. Defending free speech and pretending in a particular case that the speech is praiseworthy are two different things. Hebdo is a worthless publication, but it has a right to be published and we an obligation to defend this right. These two things are quite distinct. A little nuance please.